Candy Floss! A huge cloud of sticky nothingness made out of one small spoon of sugar. And the person in the picture can’t actually see where they are going because of that one spoonful of sugar! I was recently coaching someone who had what was to her a huge problem. Together we began to look at the problem in detail; it was genuinely causing my client concern and some pain. As we went back to the roots of the issue it became apparent to both of us that this problem had grown out of all proportion. My client had not had an opportunity to reflect on what was going on for her and the size of her dilemma had grown- in direct proportion to the amount of time she had spent thinking about it! She had over-thought it, (or spun it) without testing out any of her thoughts or hypotheses. A small spoonful of sugar had been dropped in and it had spun and spun in her head until it had become something huge and insurmountable. 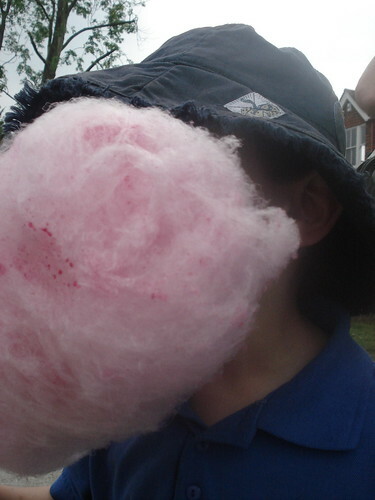 Yet closer examination revealed that the candy floss syndrome (CFS) was at work. The concerns were not truly substantial (although they felt it at the time) and a quick bite into them soon deflated the cloud! I don’t want to go too far with this analogy but it’s a useful idea to use sometimes. We all do it from time to time. We get a thought stuck in our head which gathers size at speed as we spin and spin it, and before we know it we have ourselves a huge sticky problem! Take a few moments to bite into it, really look at the issue and then see if it is still as big! Consider it from all points of view. It may just turn out to be an acute case of candy floss syndrome! What helps you keep a sense of perspective? Hi Jane, I think I used to be very good at this candy floss syndrome, I took lessons from my mother-in-law, who we used to say had a PhD degree in advance worrying. Her example actually helped me stop letting things get quite so out of hard. We all backslide sometimes and I just have to think if I am advance worrying or as you call it have CFS! Hi Jane. Really love this analogy! I think the ‘squashing/eating of candyfloss’ will be a great visual way for me to deal with future bouts of CFS! Many thanks, Helen. I had to stop myself getting carried away with it! But I’m glad it helps. And hi Julie, I think quite a few of us could pass exams in advance worrying! One of my favourite questions to myself and others is: is there anything you can do about this right now?. If the answer is no, stop worrying. if yes, do it!